Florida' s 14 competencies, including key pedagogical concepts, theories, and relevant laws. 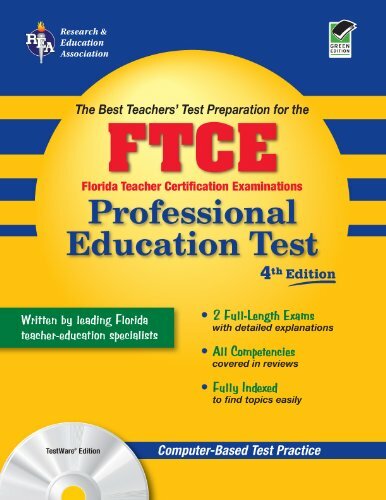 * Lessons reinforce necessary skills * Key tutorials enhance specific abilities needed on the test * Targeted drills increase comprehension and help organize study Practice for real * Create the closest experience to test-day conditions with the book' s two full-length practice tests on REA' s TESTware CD, featuring test-taking against the clock, instant scoring by topic, handy mark-and-return function, pause function, and more * OR choose paper-and-pencil testing at your own pace * Chart your progress with full and detailed explanations of all answers * Boost confidence with test-taking strategies and experienced advice Get to the head of the class! Get certified! "REA books and software have proven to be the extra supportteacher candidates need to pass their challenging test for state licensure. Our comprehensive study guides are teacher-recommended and written by educators who have mastered the test and the related program of study."" "" " " "